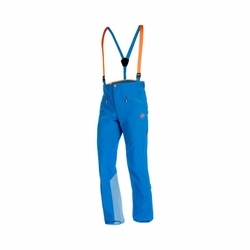 Mammut Nordwand Pro HS Pants. Like pants like jacket. In extreme situations when ice climbing or on mountain tours, the best hard shell is nothing without equivalent weather protection pants. Mammut therefore revised the Nordwand Pro HS Pants Men from the new Eiger Extreme collection and made them even better. As with the Nordwand Pro HS Jacket, Mammut used a robust, lightweight and elastic GORE-TEX Pro material which works in combination with the climbing-specific tailoring to create the ideal symbiosis of weather protection and freedom of movement. The waist can be adjusted quickly and easily from the outside, two waterproof 3/4 zippers provide ventilation as required and the dropseat with a waterproof 2-way zipper avoids the need to take them off. The gaiters can be adjusted perfectly to suit ski or mountaineering boots and both the seam edge reinforcements and crampon protection are made from the practically indestructible Dyneema material. Which means: the Nordwand Pro HS Pants Men are Mammut's best pants for extreme situations.